I Love My Fluevogs. I bought them just before I started my professional life 4 years ago, and they are sturdy & comfortable in all situations while remaining girly & stylish enough to satisfy my inner urban princess. Once you find a shoe that you can wear to cyber-goth clubs and yet still has enough traction to cover a classroom in seconds to stop a student from lighting a desk on fire, you stand by that shoe. Oddly enough, I seem to have a problem finding sandals that fit these high standards, and while I would love a light-weight shoe for the summer, my 'vogs end up on my feet year round for lack of something equally fabulous. This, of course, creates a burning need for cute anklets in the hot summer months. I wanted something lacier and less substantial than any other pattern I could find, so I juggled a few things together on an avian theme, girled it up, used the Koigu colour I love (that coincidentally matches my new favourite summer dress), and ended up with a very birdy princess sock. The 7-stitch lace repeat pattern is Lace Wings from the Vogue Dictionary of Knitted Stitches, which I found in this anklet pattern. 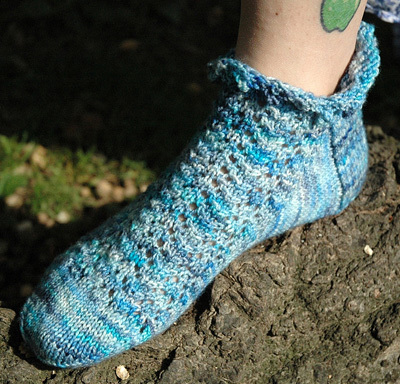 I also made good use of the Yarn Harlot's sock recipe in her book Knitting Rules!, which would be a good resource to consult if you want to change the sizing. In addition, I used her instructions for Eye of Partridge Heel, which I chose for the fowl associations but fell in love with after it made the variegations on the Koigu pop like a mosaic. The name of this sock is both a cheer for my shoes ('Vog on, my friend!) 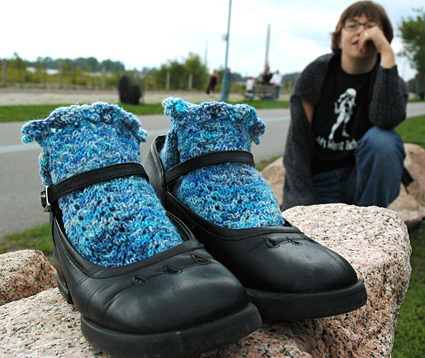 and a reference to The Hitchhiker's Guide to the Galaxy, a movie I watched obsessively as I knit the first pair. Special thanks to the Drunken Knitters of Toronto for providing a name for the toe-up variety. 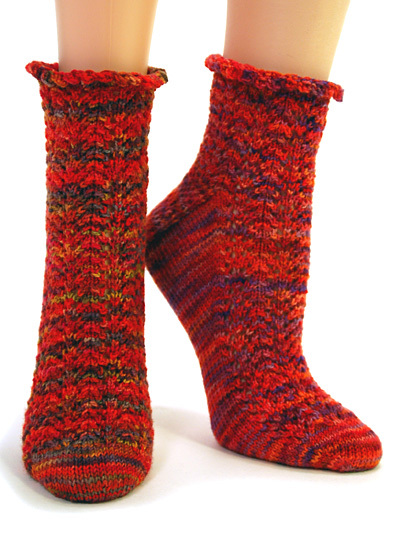 Extra-special thanks to Michelle DesGroseiliers, who test-knit & snapped the toe-up version. She's awesome! Will comfortably stretch to fit up to 9.5 inches. SKP: Slip 1, knit 1, pass slipped st over st just knit. M1p: Make 1 purlwise. Insert left needle, from back to front, under horizontal strand which lies between last stitch worked, and next stitch. Purl into the front of this loop. Using Knitted Cast-on, *CO 5 sts, BO 2 sts, slip remaining st on right needle back to left needle, repeat from * for Picot Cast-on. Place slip knot on left needle. Insert right needle into loop, wrap yarn and draw through as if to knit but do not remove slip knot from needle. Place new stitch onto left needle. *Insert right needle between the last 2 stitches made on the left needle. Wrap yarn and draw through as if to knit but do not remove stitch from left needle. Place new stitch on left needle. Repeat from * for cable cast-on. Round 1: [K1, k2tog, yo, k1, yo, SKP, k1] to end. Rounds 2 & 4: K all sts. Round 3: [K2tog, yo, k3, yo, SKP] to end. Repeat Rounds 1-4 for Lace Pattern. Using Picot Cast-on, CO 60 sts. Distribute sts evenly between 4 needles and join to begin working in the round, being careful not to twist. Next Round: [K13, k2tog] to end. 56 sts. Work 7 rounds in Lace Pattern, or until leg is desired length to top of heel, ending with Round 3 of pattern. The heel flap is worked back and forth over the first 28 sts of the round. When working the first row of the flap, work all 28 sts onto one needle; the remaining 28 sts will remain on hold on needles. Row 1 [RS]: [Sl 1, k1] 14 times. Rows 2 & 4 [WS]: Sl 1, p27. Row 3 [RS]: Sl 1, [sl 1, k1] 13 times, k1. Repeat these 4 rows 9 times more. There are 20 slipped sts along each edge of the flap. Row 1 [RS]: K17, k2tog, k1. Turn work. Row 2 [WS]: Sl 1, p7, p2tog, p1. Turn work. Row 3 [RS]: Sl1, k8, k2tog, k1. Turn work. Row 4 [WS]: Sl1, p9, p2tog, p1. Turn work. Row 5 [RS]: Sl1, k10, k2tog, k1. Turn work. Row 6 [WS]: Sl1, p11, p2tog, p1. Turn work. Row 7 [RS]: Sl1, k12, k2tog, k1. Turn work. Row 8 [WS]: Sl1, p13, p2tog, p1. Turn work. Row 9 [RS]: Sl1, k14, k2tog, k1. Turn work. Row 10 [WS]: Sl1, p15, p2tog, p1. Turn work. 18 sts. K 18 heel sts. Using the same needle, pick up and k 20 sts (1 st in each slipped st) along left edge of heel flap. This needle will be designated Needle 1. Using a second and third needle, k held 28 sts of instep (Round 4 of Lace Pattern; k 14 sts onto each needle). These needles will be designated Needles 2 and 3. Using a third needle, pick up and k 20 sts along remaining edge of heel flap, then k first 9 heel sts from Needle 1. This needle will be designated Needle 4. There are 86 sts: 29 sts each on Needles 1 and 3, and 28 sts on Needle 2. Center bottom of heel will now be beginning of round. Gusset Round 1: K to last 3 sts on Needle 1, k2tog, k1; work sts on Needles 2 and 3 in Lace Pattern as set; k1, SKP, k to end of Needle 4. Repeat these 2 rounds 14 times more. 56 sts: 14 sts on each needle. Continue in pattern as set, working sts on Needles 1 and 4 in stockinette st and sts on Needles 2 and 3 in Lace Pattern, until work measures 1.5 inches less than desired length to end of toe. Toe Round 1: K to last 3 sts on Needle 1, k2tog, k1; k1, SKP, k to end of Needle 2; k to last 3 sts on Needle 3, k2tog, k1; k1, SKP, k to end of Needle 4. Toe Round 2: K all sts. Repeat these 2 rounds 5 times more. 32 sts. Work Toe Round 1 only, 5 times more. 12 sts. Graft sts from Needle 1 to sts on Needle 2. Using Judy's Magic Cast-on (directions here), CO 24 sts (12 sts on each of 2 needles). Shape toe as directed in article, increasing until there are 56 sts. Divide sts evenly between 4 needles: 14 sts on each needle. Set-up Round: Work Round 1 of Lace Pattern over sts on Needles 1 and 2; k all sts on Needles 3 and 4. Continue in pattern as set, working first 28 sts of round in Lace Pattern and last 28 sts of round in stockinette st, until work measures 4 inches less than desired foot length. Round 1: Work sts on Needles 1 and 2 in pattern; k1, m1, k to end of Needle 3; k to last st of Needle 4, m1, k1. Round 2: Work all sts in pattern as set. Repeat these 2 rounds 15 times more. 88 sts. Work sts on Needles 1 and 2 in pattern. Heel will be worked back and forth over sts on Needles 3 and 4. Row 1 [RS]: K39, m1, k1, w&t. Row 2 [WS]: P20, m1p, p1, w&t. Row 3 [RS]: K18, m1, k1, w&t. Row 4 [WS]: P16, m1p, p1, w&t. Row 5 [RS]: K14, m1, k1, w&t. Row 6 [WS]: P12, m1p, p1, w&t. Row 7 [RS]: K10, m1, k1, w&t. Row 8 [WS]: P8, m1p, p1, w&t. 96 sts: 14 sts each on Needles 1 and 2, 34 sts each on Needles 3 and 4. K to end of Needle 4, working wraps together with wrapped sts. Work all sts on Needles 1 and 2 in pattern; k all sts on Needle 3, working wraps together with wrapped sts; k first 14 sts on Needle 4. Turn work (do not wrap st). Row 1: [WS]: Sl 1, p26, p2tog. Turn work. Row 2: [RS]: [Sl 1, k1] 13 times, sl 1, ssk. Turn work. Row 3: [WS]: Sl 1, p26, p2tog. Turn work. Row 4: [RS]: Sl 1, [sl 1, k1] 13 times, ssk. Turn work. Repeat these 4 rows 9 times more; do not turn work at end of last row. 56 sts. You will be at end of Needle 4. BO all sts using Picot Bind-off. Aleta (a.k.a. 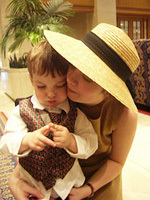 Rocketbride) knits, parents, works, reads, writes, dances and engages in tomfoolery; all of which she does in her 'vogs. She lives in a big rock n roll house with her mom, dad, younger brother, husband and toddler, and she works on filling up the basement apartment with yarn. English major, high school teacher, wife, mommy, part-time goth & full-time bon vivant: it's hard to be patient when you're jet-propelled. Love to Michelle and Jacquie, Toronto Drunken Knitters par excellence, who made this dream a reality!